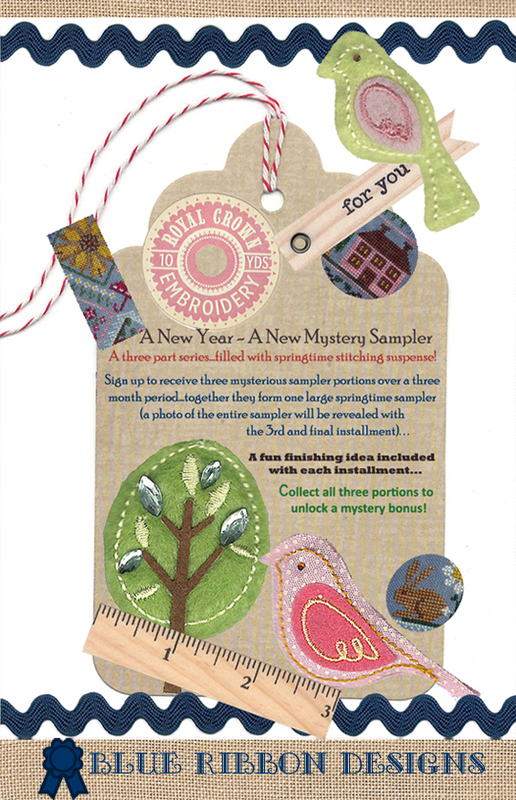 Norden Crafts: It's time to reveal who the Mystery Sampler Designer is! It's time to reveal who the Mystery Sampler Designer is! Blue Ribbon Designs Presents a Mystery Sampler Club distributed Exclusively through Norden Crafts! A New Year is coming soon, and a new Mystery Sampler Springs Upon Us! A three part series...filled with springtime stitching suspense! Sign up to receive three mysterious sampler portions over a three month period...together they form one large springtime sampler! A fun finishing idea will be included with each installment. Collect all three portions to unlock a mystery bonus. The fun begins on January 21st, but don't delay in responding! Shop Owners - check your inbox for the sign up form, and more details about the club!